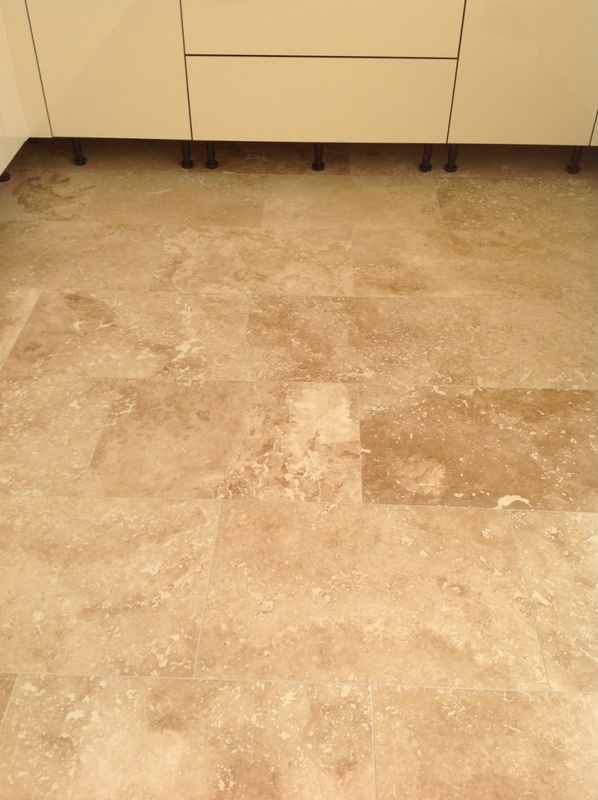 Travertine is known on the international market for being very distinctive in character and very durable, making it a very popular choice for tiled flooring in properties worldwide. 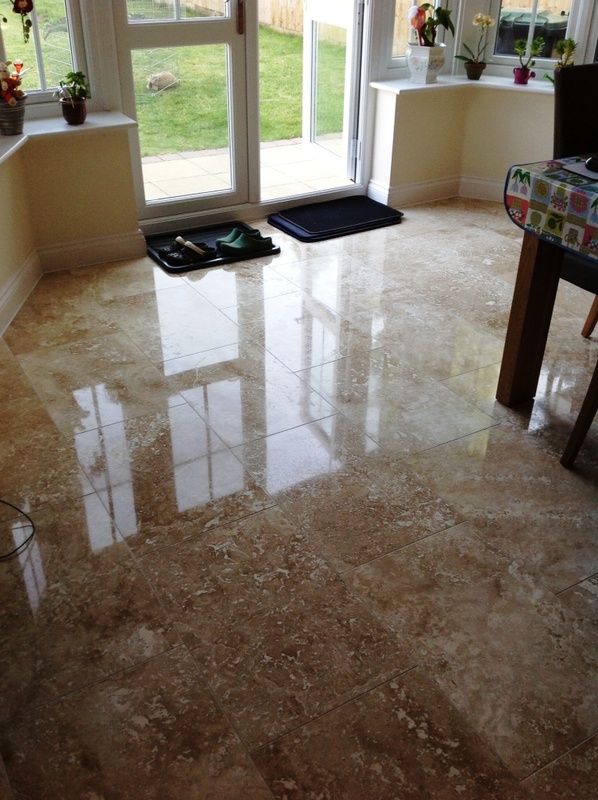 However, the stone does require regular professional maintenance and polishing to keep it looking it top shape. 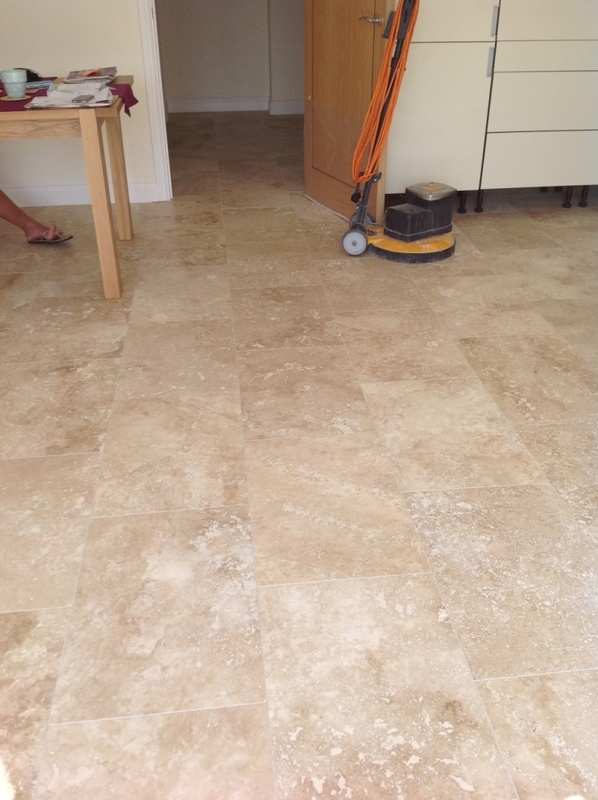 I recently visited a nice property in Polegate, a town not too far away from the seaside resort of Eastbourne, in which a large Travertine tiled floor had been recently installed in the lounge and kitchen, but not finished to the standard that the customer had wanted. The customer had visited our website and, upon seeing some of our other work, asked us to finish to a high standard the job the other company had started. The first part of the job involved giving the floor a thorough clean to remove and debris and dirt that had built up since the initial installation. Before beginning we removed the kickboards under the kitchen units and covered the skirting boards and walls with a plastic sheet to protect them during the cleaning process. 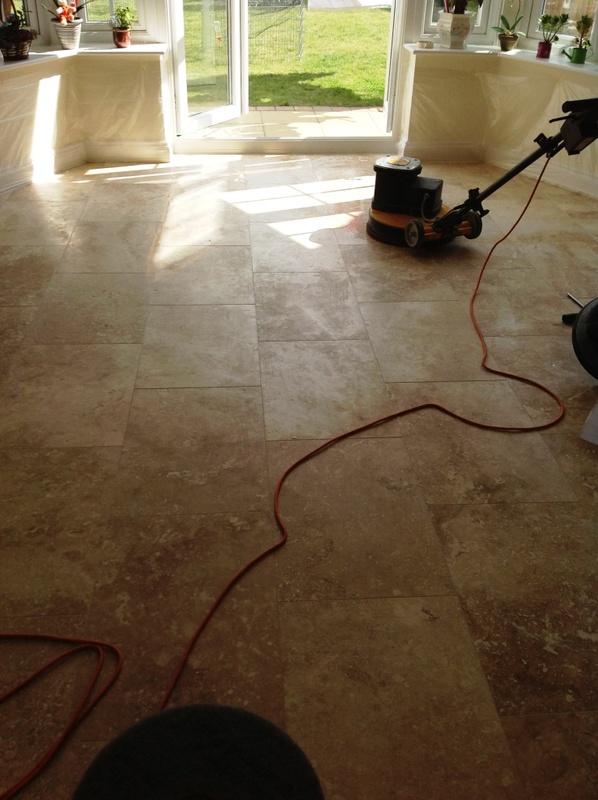 The product we used to clean the tiles and grout is known as Tile Doctor Pro Clean, a high alkaline solution that always provides reliable and consistent results when tackling soiled floors. The solution was applied liberally across the floor and left to dwell for a short period before being worked in with a scrubbing pad fitted to a rotary machine – as well as a specialised grout brush for the grout. We then thoroughly rinsed off the floor using a state of the art truck-mounted pressure washer, resulting a spotless floor. Next, we addressed the many small porous holes that commonly occur in Travertine due to a natural corrosion process called ‘pitting’. These pitted holes not only spoil the appearance of the tiles, they also act as natural habits for ingrained dirt! It’s important therefore that we filled them with a resin to smoothen the appearance of the floor and protect it against ingrained dirt. Following this, we moved on to a process we know as burnishing, which involves the application of diamond encrusted pads to remove old sealers, smoothen the rough surface of the floor, and hone the stone to provide it with a polished appearance. We started with a Coarse 400 grit pad to strip away any old sealers and level off the rough surface, before refining this with the Medium 800 grit pad for an initial polish, Fine 1500 grit pad for the second polish, and Very Fine 3000 grit pad for the final polish. Each pad is used with a small amount of water as lubricant. Finally, we applied Tile Doctor Shine Powder, which is a crystallising powder sealer that ensures a very high shine and a tough, durable finish. This powder is applied directly to the tiles in combination with at least ½ a litre of water and a soft white buffing pad. The customer was ecstatic with the results, being particularly pleased that she got the floor looking the way she originally wanted without significant expense, not to mention stress. 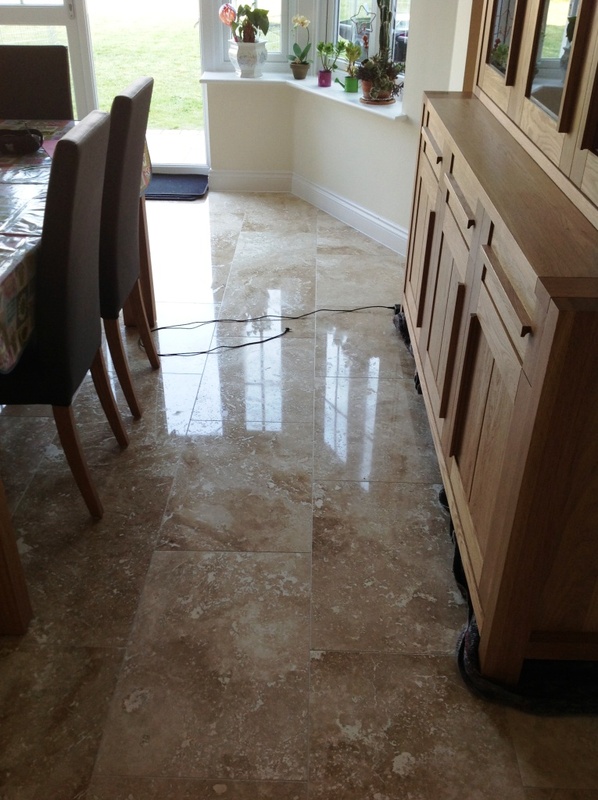 This entry was posted in Work History and tagged east sussex, Polegate, Polished, Sealed, Tiles, travertine by AbzDominise. Bookmark the permalink.